Not to be confused with Arthur Roy Brown, Canadian World War I RAF fighter ace credited with shooting down Manfred von Richthofen, the Red Baron. Lieutenant-Colonel Sir Arthur Whitten Brown, KBE (23 July 1886 – 4 October 1948) was the navigator of the first successful non-stop transatlantic flight. Arthur Whitten Brown was born in Glasgow to American parents; his father had been sent to Scotland to evaluate the feasibility of siting a Westinghouse factory in Clydeside. The factory was eventually sited in Trafford Park in Stretford, Lancashire, and the family subsequently relocated there. Brown began his career in engineering before the outbreak of World War I and undertook an apprenticeship with British Westinghouse in Manchester. In 1914, he enlisted in the ranks of the University and Public Schools Brigade (UPS) for which he had to take out British citizenship. The ranks of the UPS were full of potential officers and Brown was one of those who sought a commission to become a Second Lieutenant in the 3rd (Special Reserve) Battalion of the Manchester Regiment. After service in France, Brown was seconded to 2 Squadron Royal Flying Corps as an observer. Brown's aircraft was shot down by anti-aircraft fire over Vendin-le-Vieil in France while on artillery observation duties. He was sent back to England to recuperate but returned only to be shot down again, this time with a punctured fuel tank, near Bapaume in B.E.2c (number 2673) on a reconnaissance flight on 10 November 1915. Brown and his pilot, 2nd Lt. H. W. Medlicott, were captured by the Germans. (In June 1918 Medlicott was shot by the Germans while attempting to escape for the fourteenth time). Later interned in Switzerland, Brown was repatriated in September 1917. After a period of leave he went to work with Major Kennedy RAF in the Ministry of Munitions. This led Brown to meet Kennedy's daughters, one of whom he later married. After the war Brown sought various appointments that would give him the security to allow him to marry. One of the firms he approached was Vickers, a consequence of which was that he was asked if he would be the navigator for the proposed transatlantic flight, partnering John Alcock, who had already been chosen as pilot. The flight from St. John's, Newfoundland to Clifden, Connemara, Ireland took place on 14 June 1919. They departed St John's at 1.45 pm local time, and landed in Derrygimla bog 16 hours and 12 minutes later after flying 1,980 miles (3,168 km). The flight was made in a modified Vickers Vimy bomber, and won a £10,000 prize offered by London's Daily Mail newspaper for the first non-stop flight across the Atlantic. A few days after the flight both Brown and Alcock were honoured with a reception at Windsor Castle during which King George V invested them with their insignia as Knights Commanders of the Order of the British Empire. Later he worked for Metropolitan-Vickers (MetroVick), the company that had once been British Westinghouse. In 1923 he was appointed chief representative for Metropolitan-Vickers in the Swansea area. During World War II Brown served in the Home Guard as a Lieutenant-Colonel before resigning his commission in July 1941, rejoining the RAF and working in RAF Training Command as a pilot officer dealing with navigation. His health deteriorated and by mid-1943 he had to resign from the RAFVR and give up his Air Training Corps commitments on medical advice. Brown's only son, Arthur (known as Buster), was killed on the night of 5/6 June 1944, aged 22, while serving with the RAF as a Flight Lieutenant. His aircraft, a de Havilland Mosquito VI NT122, of 605 Squadron, crashed in the Netherlands. Buster was buried at the general cemetery in Hoorn, the town closest to the crash. The death of his only son affected Brown badly. By 1948 Brown's health had again deteriorated, although he was allowed to undertake restricted duties as general manager for Metropolitan-Vickers at the Wind Street offices. Brown died in his sleep on 4 October 1948 from an accidental overdose of Veronal, aged 62. Probate was granted on 16 December 1948 to his widow, listed as Marguerite Kathleen Whitten Brown, for effects totalling £5,002 0s 3d. Brown's widow died on 1 May 1952, aged 56, at Brunswick Nursing Home, Fyfnone, Swansea. Probate was dated 9 June 1952 and left effects of £4,342 6s 11d to an Eileen Howard Kennedy, spinster. Brown and his wife's ashes are interred at St Margaret Churchyard, Tylers Green, Buckinghamshire, England. ^ Ralph S. Cooper, D.V.M. "Arthur Whitten Brown". Earlyaviators.com. Retrieved 3 December 2010. 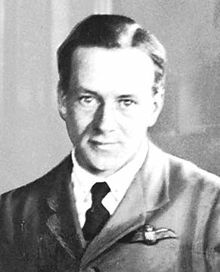 ^ "Sir Arthur Whitten Brown (British aviator) – Britannica Online Encyclopedia". Britannica.com. Retrieved 3 December 2010. ^ "Alcock and Brown – Great Britain". Aviation-history.com. Archived from the original on 13 December 2010. Retrieved 3 December 2010. ^ "Introduction John Alcock and Arthur Whitten Brown were two British fliers". Fi.edu. Archived from the original on 29 June 2011. Retrieved 3 December 2010. ^ "No. 31422". The London Gazette. 27 June 1919. p. 8087. ^ "Captain Jack Alcock (1892–1919)" (PDF). Museum of Science & Industry, Manchester, England. Archived (PDF) from the original on 10 April 2008. Retrieved 8 April 2008. ^ "No. 36054". The London Gazette (Supplement). 11 June 1943. p. 2735. ^ "Arthur Whitten Brown (1886–1948) – Find A Grave Memorial". Findagrave.com. Retrieved 3 December 2010. Photograph of Britannia Airways Boeing 737 named "Sir Arthur Whitten Brown"
This page is based on the Wikipedia article Arthur Whitten Brown; it is used under the Creative Commons Attribution-ShareAlike 3.0 Unported License (CC-BY-SA). You may redistribute it, verbatim or modified, providing that you comply with the terms of the CC-BY-SA.